Vets in training tend to spend less time learning about rabbits than they do cats or dogs. Rabbit medicine is often taught alongside “exotic species”, as they are also very different from cats and dogs physiologically, behaviourally and anatomically. 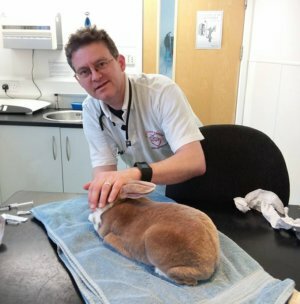 So, it is important to choose a vet who has developed a specific knowledge of rabbits, either through their University training or in post-graduate CPD. Start with people you know who have companion rabbits. If they are on the ball then they should have a rabbit-savvy vet. Look for vets on our ‘Rabbit friendly vet list‘. If you are a member of a good online rabbit forum you could ask for recommendations. Otherwise, it’s a case of going through the yellow pages or the RCVS Find A Vet website and finding all vets local to you. Whichever way you have come across a vet to consider, you should always ring them yourself and ask some questions to satisfy yourself that they’ll be able to care for your rabbits. Do you have a separate waiting area for rabbits? Rabbits are prey animals and will find the experience of waiting in an area with noisy dogs, and the smells of dogs, cats and other animals very stressful. Vets may have separate rooms, or at least separate areas, or times at which only prey animals are seen. 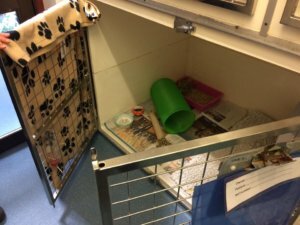 Do you have a separate kennelling area for rabbits? Rabbits will find the experience of being hospitalised alongside predator species very stressful. The sound of dogs barking and cats yowling near them will be even more stressful and may hinder recovery from any treatment. If vets cannot offer a separate room, some have small animal days where dogs are not admitted for operations. Will companions be kept together? Vets should also be aware of the importance of hospitalising bonded pairs together if at all possible. If only one of your rabbits needs to visit the vet, you should still take them both (or all if you have a group). This prevents problems with reintroducing back at home (a rabbit returning to the vet will smell different from other rabbits). It also benefits the poorly rabbit, his mate will aid his recovery. The exception to this is something contagious like myxomatosis, or if you need to keep an eye on diet or monitor their poops. Do you routinely spay and castrate rabbits? What is your anaesthetic protocol? The best protocol is one that the vet is most comfortable and experienced using, but some anaesthetic combinations are regarded as safer than others. Both injectable anaesthetic regimes by themselves, or with inhalational (gas) anaesthetics, may be used. Vet practices that seem nervous about anaesthetising rabbits should be avoided because they may not have updated their anaesthetic protocol and peri-operative management in the light of recent findings, and this may ring an alarm bell. They should be willing to discuss pain relief options, and to dispense pain relief on the day and for as long as neccesary afterwards. They should be well versed in spotting signs of pain in rabbits. Do any of the vets at this practice particularly like seeing rabbits? If the receptionist says ‘all of them’ this is likely to mean that no vet takes a special interest in rabbits and so this may not be a good sign. Often, there is one vet who is very keen on rabbits and this benefits the practice because they can all learn from him/her. Make sure you get a named vet, and see that vet whenever possible. Very often the vets will be pleased to speak to new or potential clients and this is a good sign, ask them if they have completed any rabbit CPD (Continuing Professional Development – extra studying!) recently. The RWAF holds an annual vet conference, and veterinary CPD events, and there are other CPD events such as BSAVA and London Vet Show that do rabbit lectures and workshops. Many practices also have bunny-mad vet nurses, which is particularly good – it is the nurses who maintain anaesthesia and see to their after-care. Where will you have to go in an emergency? We recognise that many practices make use of dedicated out of hours providers. Some of these out of hours providers take out of hours calls from the practices clients, who then travel directly there for care at nights and weekends, but retain their own in patients already undergoing care at their own practices. In some cases, in addition to this, any inpatients are transported to the out of hours provider by owner or vet at the end of the day, and returned to the primary vet, or discharged back to the owner in the morning. There are advantages and disadvantages in this approach vs the traditional local vet providing their own out of hours, and that is a debate beyond our remit. However, this obviously complicates how we assess practices care and their staff’s knowledge and experience of rabbit patients, and so we are asking practices (re)applying to be listed, to let us know if either of these situations occur at their practice. The answer should be yes, against both Myxomatosis and RVHD (1 and 2). Be wary of any advice against vaccinating as ‘not necessary’ because they are not aware of myxomatosis or RVHD in the area (both can strike at any time) or if rabbits are house rabbits (because they can still catch both). Consider suitable pain relief as appropriate. Take steps to keep rabbits warm during and after surgery. Intubate or use a Vgel airway device as appropriate with your rabbit if required (this may not be possible during some procedures such as dentals, but is recommended as standard practice).